Why do we need proximity marketing apps? Proximity marketing apps play a major role in those I-want-to-know, I-want-to-go and I-want-to-buy moments. It’s a powerful way for offline businesses to establish an extended communication channel with consumers and keep them engaged. Also, with the demise of Google’s Nearby Notifications (after 6th Dec 2018), apps are the way to go ahead with proximity marketing. This obviously is a good news for businesses who are looking to enhance the customer experience and hence win loyal customers. The natural behaviour of proximity marketing is contextually relevant and hence extremely helpful. However, with increasing misuse of the Nearby service, marketing messages became irrelevant and spammy. With apps, on the other hand, consumers have complete control over what they receive and the notification behaviour. Not just that, some of the widely used apps, like NearBee also have an anti-spam algorithm incorporated. This not just enhances the customer experience but also makes communication relevant and helpful. 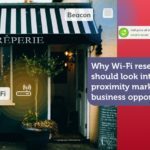 How to choose the best proximity marketing app? Before browsing through the list of proximity apps, it is important to understand the factors that you need to consider while making a choice. In this post, we will discuss a few apps which we found best in our research, in terms of their features, ease of use, interactivity and personalization factor. NearBee is a lightweight, free application that connects with all beacons in range to broadcast proximity marketing notifications. Hardware agnostic app – This means the app scans for ALL beacons irrespective of the beacon provider. It makes the app a perfect alternative to Google Nearby. Designed to work across industries – This app works for retail, real estate, museums, airports and restaurants alike. Has a robust anti-spam algorithm at its core – The app has complete control over the frequency of messages being sent, relevancy of these notifications and duplication of campaigns. Schedule campaigns to target specific consumers – The Beaconstac dashboard allows marketers to schedule campaigns for specific days of the year or hours of the day. Bleesk app is another proximity marketing app that scans and detects beacon notifications. The app is designed to receive notifications across industries, however, the app features are built with a special focus on events. 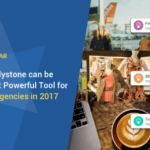 Has an inbuilt QR code scanner – In addition to receiving proximity marketing notifications, this app also has the capability to scan QR codes at event locations. Appadia app is a proximity marketing app dedicated to malls and retail shops. It notifies consumers of mall information, deals, news, floor plans, shop location and other favourites based on their proximity. Available across devices – iPhones, iPad, Apple Watches and Android phones. Rebranding for clients – The app can be branded with their client’s logo and colors. This proximity marketing app gained popularity in Italy. It pushes deals, maps, local news and local event information based on the proximity of the user. Ubi.co is suitable for almost all industries – retail, malls, restaurants, public venues, fitness centres and more. One of the cons of this app, however, is that it is not available for all parts of the world. It quickly adapts to the look and feel of the brand around. These are the best proximity marketing apps in my opinion. Do you know some other beacon-aware apps that make the cut? Let us know in the comments below. 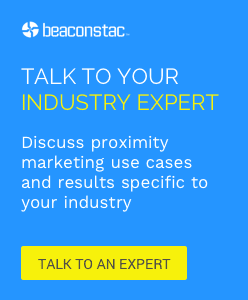 If you are looking to accelerate your proximity marketing in 2019, take a look at Beaconstac that offers an end-to-end proximity marketing solution – beacon hardware, analytics and content management system, NearBee app and SDK. What is Proximity Marketing and How does it Work?